KV5000 Kinematic Viscosity Bath with Optical Flow Detection System – Koehler Instrument Company, Inc.
KV5000 model Kinematic Viscosity Baths with optical flow detection system provide automatic viscosity measurements of petroleum and petrochemical products. Includes communication and power ports for each optical detection assembly, and can utilize up to five optical assemblies. Two additional positions are available for manual viscosity measurements, and all positions can be used in the manual mode. The interchangeable Ubbelohde, Cannon®- Fenske, and Cannon®- Fenske Opaque Reverse Flow viscometer tubes are quickly installed and removed from the detection assemblies for cleaning and simple tube changes. 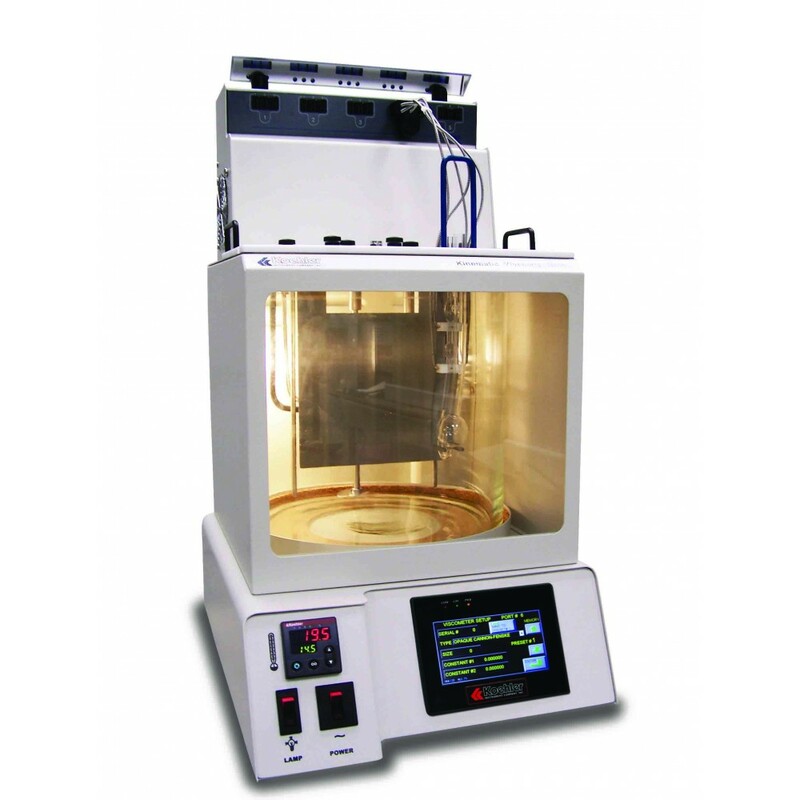 Allows for automatic viscosity measurements and results calculation without an external PC. Motorized stirrer provides complete circulation without turbulence. Microprocessor PID circuitry assures precise, reliable temperature control within ASTM specified tolerances throughout the operating range. Simple push-button controls and dual digital displays permit easy setting and monitoring of temperature. Two place calibration offset capability is provided. Built-in cooling coil facilitates temperature control at ambient or below ambient temperatures. The Kinematic Viscosity Software Package automatically downloads test data and calculates final test results from sample efflux times. Also included is a database for storing test data, determining test averages, standard deviations, and ASTM test repeatability as well as providing a method for tracking both instrument and viscometer tube calibrations.